The seaport city of Manila resides within the very core of the enormous spreading urban mass that is best known as Metro Manila. 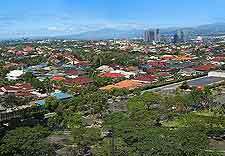 Various districts combine to make the Manila of today, the capital of the Philippines, with the most prominent including Binondo, Intramuros, Quiapo, San Miguel, San Nicolas, Santa Cruz and Tondo, with both Ermita and Malata forming the 'tourist belt' and home to the main tourist information outlets. Many visitors tend to just stay in Manila for a few days, before moving northwards to explore the highlands, or heading to the southerly beaches on the Filipino island of Mindoro. 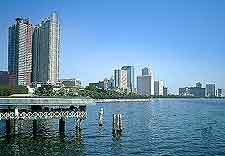 However, the city really does offer an inviting tourist scene, with hotels, restaurants and an excellent nightlife to be found never far from the Roxas Boulevard, the Taft Avenue and the Pasig River. Rizal Park (Luneta) lies just to the north of the city's famed tourist belt and forms the very heart of the city, overlooking the beautiful Manila Bay and dates back some 200 years. 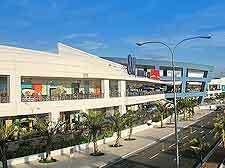 Manila is an especially lively and diverse city, with all kinds of different tourist attractions awaiting. Although a large number of the sights are historic, others simply offer a fun day out, suitable for all the family. Particularly popular is the Enchanted Kingdom and its Space Shuttle roller coaster, along with the awesome water slides and pools that make up Splash Island. To experience a little of the life and soul of Manila, spend time exploring the Divisoria Market and haggling over the prices, or alternatively, check out the various exhibits and performances found within both the Cultural Centre of the Philippines and the Nayong Filipino Cultural Park. 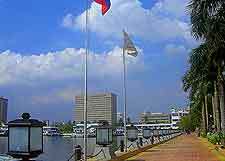 More information about Manila Tourist Attractions. Many old and historical buildings are spread around Manila, offering a taste of the past. Dating back to the latter part of the 16th century, Fort Santiago was once used as a prison and now serves as a popular park. Of a similar age, San Agustin Church features its very own collection of religious art works, while much newer and equally impressive, the Manila Cathedral of today was built as recently as the mid-20th century, after five predecessors suffered at the hands of fire, war and earthquakes. For a touch of grandeur, the gleaming-white riverside Malacanang Palace will provide just that and is actually the residence of none other than the President of the Philippines. More information about Manila Landmarks and Monuments. Information about Manila's rich history and culture is on hand within the city's plentiful selection of museums. This is particularly the case at the National Museum of the Philippines in Rizal Park, where many important artefacts are displayed. A similar selection of treasures is housed within the Metropolitan Museum of Manila in the Pasay City area, although families with their children tend to favour an afternoon out at the Philippine Science Centrum or the Museo Pambata (Children's Museum). For a taste of either modern or local Filipino art, check out the CCP Contemporary Art Museum of the Philippines and the Art Gallery Philippines respectively. More information about Manila Museums and Manila Art Galleries. 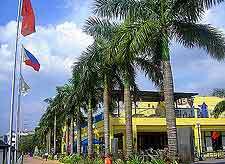 There are lots of good reasons to leave Manila for the day, and the nearby beaches and resorts of Cavite are just one of them, boasting great tourist appeal. Excursions to Anilao are also popular, where scuba diving and snorkelling is often the order of the day. Less than an hour away, Antipolo City makes for a good day trip, being home to many excellent restaurants and superb panoramas of Metro Manila. San Fernando is just a little farther and famed for its December Lantern Festival, with both the towns of Taal and Tagaytay also being close by, along with Corregidor Island, which is steeped in military history. 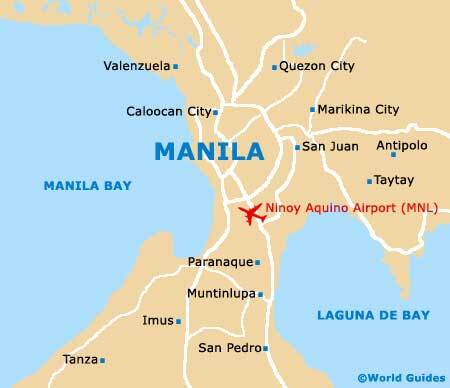 More information about Manila Attractions Nearby.